High protein, high calorie, low sugar: that’s what GIANT Mass Gainer stands for. You take a weight gainer because you want to add some mass, but you don’t want to get fat. To achieve this, it’s essential to continuously feed your muscles with the right nutrition. GIANT Mass Gainer was developed based on the best relationship between proteins, carbohydrates and fatty acids for stimulating muscle growth. This excellent weight gainer delivers a massive 850 calories derived from high-quality proteins and sugar-free carbs, as well as healthy fatty acids (medium-chain-triglycerides). GIANT Mass Gainer is the most high-end weight gainer on the market and can be taken twice daily. Immediate and continuous muscle fuel! What can I expect from this weight gainer, how fast and how many kilograms will I gain? To gain just one extra kilogram you need to consume 7,000 calories more than what you consume daily. 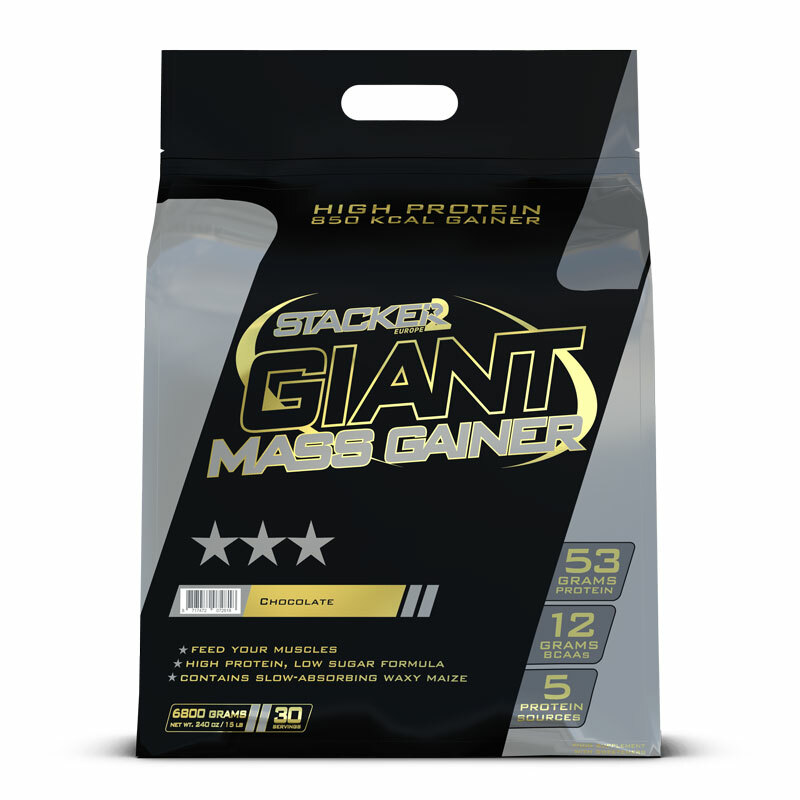 GIANT Mass Gainer provides approximately 850 calories per serving. By taking two servings per day, you will be able to gain 7 kilograms of weight in the first month! What is the difference between GIANT Mass Gainer and brands that have a weight gainer with a simpler composition? With GIANT Mass Gainer everything is about the quality and knowledge of ingredients. To prevent you from gaining primarily fat, you need a gainer containing carbs that your body absorbs slowly. 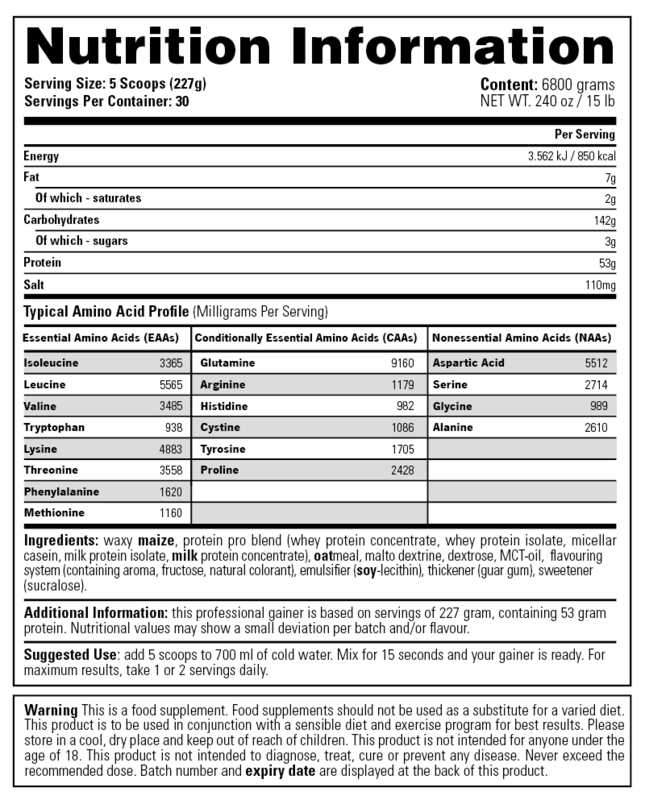 The main ingredient of GIANT Mass Gainer is Waxy Maize (99% amylopectin), a carbohydrate with a low glycemic index. You won’t experience any blood sugar peaks, so your body won’t receive a signal to store excess energy as fat. This is GIANT Mass Gainer’s biggest advantage: you can gain weight quickly without your fat percentage escalate. In addition to these slow-absorbing carbs, GIANT Mass Gainer contains healthy fats and three natural sources of high-quality protein: whey proteins, casein proteins and milk proteins. To support your weight gain with immediate and continuous muscle fuel. So if you want to gain weight quickly but want to keep your fat percentage low, you can only achieve this with a smart combination of the right nutrients in the right quality: GIANT Mass Gainer. Add 5 scoops to 700 ml of cold water. Mix for 15 seconds and your gainer is ready. For maximum results, take 1 or 2 servings daily. Great product. The waxy maize carbohydrate is so easy to digest that you feel rested and fit just after the training! Crazy that there are no reviews yet... Really one of the best gainers and especially the taste is nice. Especially recommended if you have to get rid of a big shake every day! Nutritional values are also in order.